Pollinate With a Bug measures 2.5 by 3.5 inches. Pollinate with a Bug is the third ACEO I have created and pictured with a Canadian penny for size reference. It is signed, numbered (003) and dated on the back. 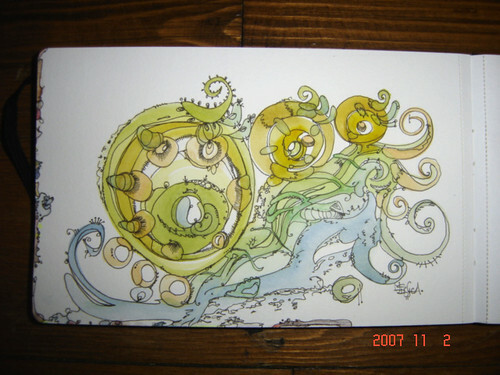 The first miniature illustration, entitled 20000 Leaugues Under the Sea can be seen here and the second ACEO, Brown eyed Fossil, here. This is an original NOT a print. Pollinate With a Bug is painted with Windsor & Newton Watercolour and inked using both a green and black Sakura 005 Micron Pen on Heavy Cold Press Watercolour Stock. All materials used in this original are of the best artist quality. I have more to say about it being my Birthday. Much more actually but must turn into bed and get up in 6.5 6 hours, go to work, then come home, eat and after that I’ll say what I gotta say. AND gosh darnit it’s good! by pen. Notice the little blue birdies upper left center facing right. The Story – One night while out clubbing in Vancouver my purse was rifled through. 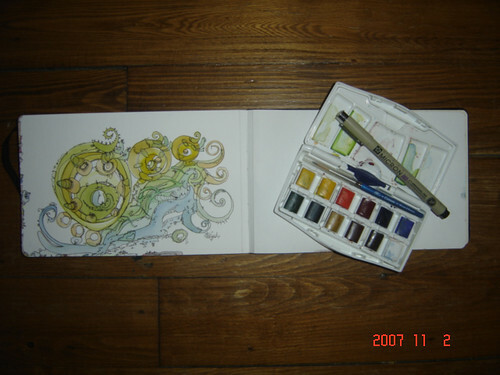 This person(s) stole my Watercolour Set which is identical to the one pictured above and nothing else. I hope they desperately needed art materials more than my poor soul at that time. For the next four years I RARELY touched watercolour content creating with acrylic and pen. The set above is a gift from Mom. The thing is this set went missing about two weeks ago. To make matters worse I thought I lost it at a club four years later here in Saint John. During.that.couple.of.days.it.was.missing I googled the set’s name and found a great pic from a Blogger named Ethan of his set. In desperation I stole his photo and emailed it to the club. So, thank you Ethan in proper Blog post form. Go and check out the art this Ethan Draws in the identical Moleskine Watercolour journal using the same Windsor & Newton Travel watercolour travel set. The conclusion – Turns out it was at a friends house and not at the club at all.